I went out for my usual late night snack because I couldn't resist the thought of stuffing my face with something from Wendy's Super Value Menu to go along with my Frosty Dairy Desert. I thought' "Oh a Caesar Salad sounds nice, it won't make me feel like I ate ten pounds of butter." Then I ordered it, got home, stared at it and for no particular reason started scanning the ingredients on the Caesar dressing package. 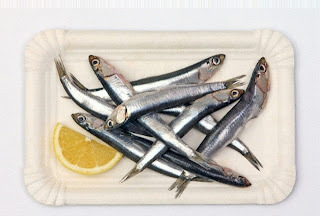 Did you know that there are ANCHOVIES! in Caesar dressing? Yes, those disgusting little creatures that we always see on Pizza in movies and thought we would never eat. No gives, No Thank you, No Gracias! Well I have news for you, most of us have probably eaten ANCHOVIES! I bet there are vegetarians out there who don't even know this. I hope they don't burst into flames upon reading this, but it is the truth. And possibly an act of terrorism, because I am terrified of what else I may be eating unknowingly. Shouldn't the packaging have a giant red call-out on the front that says, I dunno, "This product contains ANCHOVIES!"??? So please if you want to stop this kind of ludicrous behavior write to your senator, go to town meetings, stand together and unite to make sure that we are properly warned about this type of thing. Let Erin Brockovitch be your example. When she found ANCHOVIES! (or something probably similar) in the water, she did something about it. Also, my apologies go out to my sister, Amanda, for all the years that we fed her Tuna Fish and told her that it was Chicken. In other strange food news take this survey. Kinda freaks me out. I got most of the answers wrong because my motto is, "When in doubt, throw it out!" Don't worry citizens, I found the greatest invention. It smells your food to tell you if it is still fresh. I am so investing in one of these. I will be the envy of every Martha Stewart of the future. that is so gross and i used to like that dressing...i don't know if i'll be able to eat it anymore...i pretty much want to vomit right now because of it! None of that compares to ULTRA FUEL and you know it.